EDEN PRAIRIE, Minn. – As Republican congressional leaders plan to repeal the Affordable Care Act in January, grassroots leaders from four top Minnesota community groups and two prominent unions held actions at the offices of two Republican congressmen, to let the lawmakers know they oppose cuts in health care in the state. Representatives from the State, County and Municipal Employees (AFSCME), the Minnesota Nurses Association, the community religious group Isaiah, TakeAction Minnesota, the Land Stewardship Project and the Main Street Alliance of Minnesota descended on Reps. Erik Paulsen and Tom Emmer, voicing concerns about the future of health care in the state. The unions and their allies are primarily responding to the imminent threat facing the Affordable Care Act, which has helped millions of Americans gain access to health insurance for the first time, extended health care to adult children until they are 26 years old and offered protections and access to healthcare to millions of Americans with pre-existing conditions. They took the firm stance that if any change is to be made, it should improve and strengthen the policies, not bankrupt the entire American health care system while padding the pockets of insurance companies and big business. Similar groups are planning similar actions nationwide to protect the ACA. But Congress’ ruling Republicans and the incoming Republican Trump administration show few signs of paying attention. Even before Trump took over the Oval Office, GOP leaders introduced a budget “reconciliation” bill to order congressional committees—under the guise of fixing the federal budget—to take the first steps to repeal the ACA. And they’re doing so without anything to replace it. 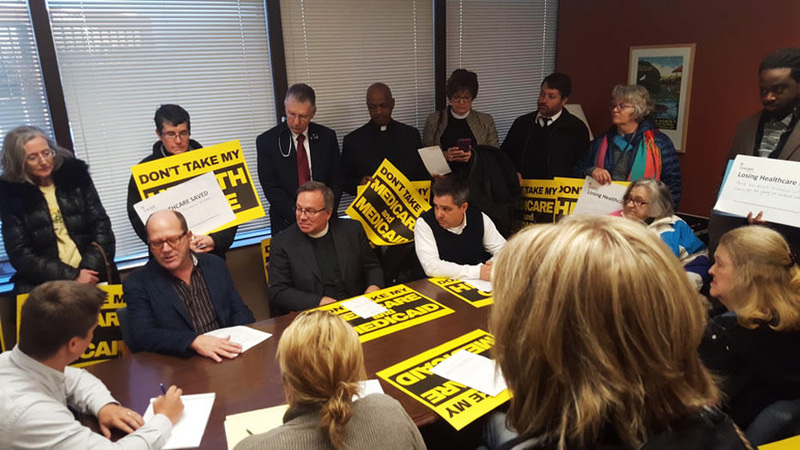 In the Minnesota lawmakers’ offices, the faith communities, business owners, nurses, farmers and the like gathered with signs saying “DON’T TAKE MY HEALTH CARE” and “DON’T TAKE MY MEDICAID AND MEDICARE” as well as personal signs sharing what losing healthcare would mean for their families. They also brought letters to their congressmen, giving their own stories as to how programs like Medicare, Medicaid, Affordable Care Act, and MNsure have been lifesaving policies. And they emphasized that demise of these programs will have devastating and life-threatening consequences for hundreds of thousands of Minnesotans and millions of people across the country. The organizations’ members invited their congressmen to schedule meetings with them to further discuss ways that they can better represent their constituents. Terry Johnson, a leader of Isaiah, has both a son and granddaughter that have distinct, chronic health issues that require both expensive and consistent care. The group said accessible health care is also important to job creation and helping families thrive. Federal and foundation data show 380,000 people could lose health insurance and Minnesota could lose $16.4 billion in federal funding with the repeal of the ACA. There are 912,000 people on Medicare and over 1 million people on Medicaid in Minnesota. Repeal would also jeopardize the health care of more than 744,000 Minnesotans with pre-existing conditions, the group said. These statistics equal 2.4 million people in a state of 5.5 million – nearly 40 percent – who will be negatively impacted by changes to health care at the federal level. 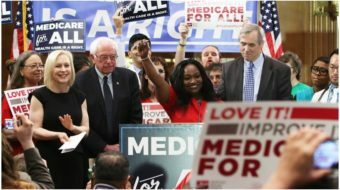 Grassroots organizations across the country are participating in a national “Hands off Our Healthcare” Day of Action, as thousands of leaders nationwide call on federal lawmakers to end the threats to the Affordable Care Act, Medicaid and Medicare. 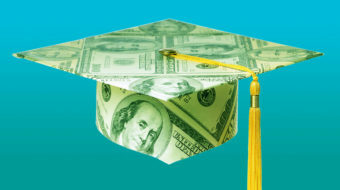 Workday Minnesota is a project of the Labor Education Service at the University of Minnesota. Workday has won many awards and has grown to be a trusted source for news about workers, the economy, worker organizations and our communities. Workday strives to present an accurate and factual account of news, events and issues through a lens focused on the interests, perspective and well-being of Minnesota's working people. 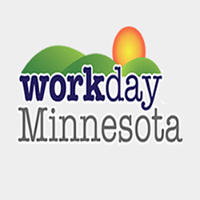 Workday is a member of the International Labor Communications Association and a partner in the Twin Cities Media Alliance.